Federal employees make a LOT of mistakes when it comes to retirement. Federal Employees Everybody makes a LOT of mistakes when it comes to retirement. It’s true, mistakes being made regarding retirement is not exclusive to federal employees. There are constantly new, news stories being published that make this point very clear to me; such as this one that says 62% of Americans have less than $1,000 in savings. To me, the BIGGEST issue doesn’t have to do with how federal employees allocate their investments or whether they’ve began planning for their increase in life insurance costs or things like that. 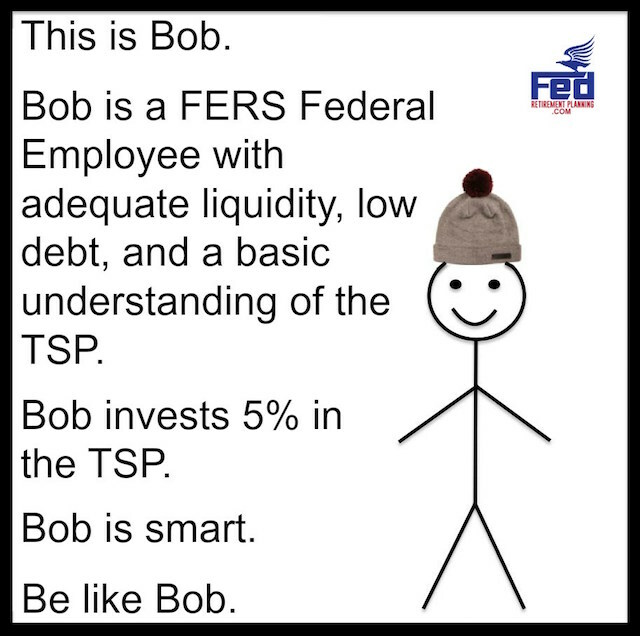 The BIGGEST federal employee retirement mistake that I see being made is: Not Contributing 5% to the TSP. This is the mistake I see more than any other–and I believe it’s due to a lack of education and discipline among other things. Today, I’m going to discuss why this is a problem and what can be done about it. Who should contribute 5% to the TSP? First off, not EVERYONE should contribute 5% to the TSP. This is something that some may argue with me on (which is fine, I love hearing other peoples’ thoughts) but I simply do not believe everyone should invest in the TSP. Now, some of those ‘requirements’ may seem silly, but I truly believe these are important pre-requisites. The first one regarding receiving 5% in matching funds is something I plan to write on in more detail in the future. But in my opinion, you would be better off investing outside of the Thrift Savings Plan if you don’t receive the 5% in matching funds. Just to state of few, more flexibility with withdrawals, more investing options, and better investing resources. Who doesn’t receive 5% in matching funds? Many military members, part-time employees, and CSRS employees to name a few. Being in debt up to your eyeballs may make for a funny commercial, but it certainly does not make for an easy life. It’s important to minimize some of the debt you have (pesky student loans I’m looking at you!) before investing. If you’re paying a higher interest rate than what you’re making in your investments you could actually be losing money. And, nobody enjoys losing money. Deciding to put your hard earned dollars into an investment without having some basic understanding of where your money is going is absurd. You don’t have to know all of the ins and outs, but having a working knowledge of what the funds are comprised of, what the historical returns are, and what kind of risk tolerance you have is absolutely essential. You wouldn’t perform surgery on someone without some sort of idea on how the body works. In the same sense, you shouldn’t place your money somewhere without an idea of how the investment works. When I first started working with federal employees and learning the various complexities of the system, the clear benefit that stood out to me was the 5% matching funds. Sure, the Federal Employee Health Benefits (FEHB) are excellent, and there are other great benefits as well, but by and large, the standout is the 5% match. Still, despite my ever increasing efforts to educate government employees on their benefits and the advantages and disadvantage, there are many people that don’t contribute 5%. The major reason I hear from people for not contributing 5% is because they simply didn’t know they received that big of a match. Now, whether or not this was their response because telling a financial planner that you don’t accept free money is like telling your mother you’ve started doing drugs. I still hear it often. The second reason I hear most often is that people are simply too broke to afford contributing 5%. Granted, not having enough money to contribute is certainly a great argument and unfortunately is a reality for many. However, when I hear this sentiment and begin digging deeper through the creation of a financial plan, I see that often times the reason there is not enough money to use towards saving for retirement is simply because money is being spent unwieldily and in the wrong places. Having a budget and a plan often frees up the resources necessary to instilling a secure future. The third and final reason I’m going to write on of why people don’t contribute 5% into their TSP is laziness. I am not making this up, I’ve been told that simply being lazy is the reason people haven’t taken the time to educate themselves on their benefits and 5% match. Being lazy is obviously not a good excuse, but if you’re reading this it probably means you’re not in this category. It takes a certain amount of effort to seek out information such as this article. The main reason people who meet the criteria I’ve set above should invest 5% in the TSP is because of the 5 % match. Excluding the match, investing in the Thrift Savings Plan has the same importance of investing in any other investment vehicle. Some things are that simple. 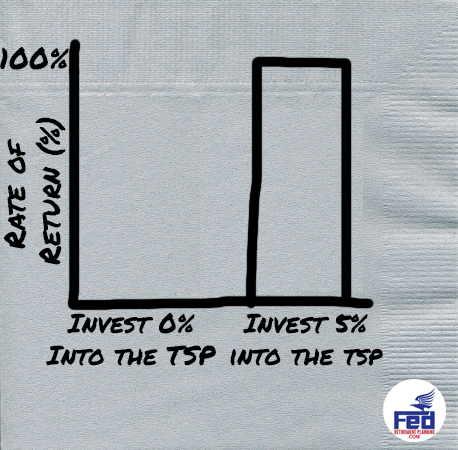 I hope I have made it clear on the importance of why you should invest 5% in the TSP. Another question that often stems from this is, “Should I invest more than 5% in the TSP?” This is a complex issue that I plan to delve into more detail later on. In the meantime, what is the biggest mistake federal employees make that you see? Reply in the comment section below! © 2019 Cooper Mitchell. All rights reserved. This article may not be reproduced without express written consent from Cooper Mitchell. Cooper Mitchell is an Investment Advisor Representative for Dane Financial, LLC, a Registered Investment Advisor, as well as a licensed insurance agent for Dane Advisory Group, LLC. He welcomes questions from federal employees on retirement matters. You can find out more about him and his company at his website, fedretirementplanning.com. Dane Financial, LLC and Dane Advisory Group, LLC are affiliated companies. Are You Losing Free Money in Your TSP Account?